Bilexys, the winner of Imagine H20’s Third Annual Business Plan Prize for Water Startups, will be a designated Technology Showcase exhibitor at the 2012 BlueTech Forum, one of the industry's premier conferences featuring innovative technologies in the water and wastewater treatment industries. Bilexys, the winner of Imagine H20’s Third Annual Business Plan Prize for Water Startups, will be a designated Technology Showcase exhibitor at the 2012 BlueTech Forum, one of the industry's premier conferences featuring innovative technologies in the water and wastewater treatment industries. Bilexys (Brisbane, Australia) won the Prize’s Pre-Revenue track while Nexus eWater (Canberra, Australia), and Tusaar, Inc. (Lafayette, Colorado) were named runners up. New Sky Energy (Boulder, Colorado) won the Prize’s Early Revenue track. Bilexys, a market revolutionary with its patent pending technology that converts wastewater to valuable chemicals, was presented the prize by Imagine H2O March 20 at the Winners Ceremony and Water Entrepreneurs Showcase held in San Francisco. Bilexys won the prize from among the nine finalists, which were all “promising new businesses with innovative wastewater solutions that unlock the unrealized value in the wastewater sector,” explains Scott Bryan, Imagine H2O’s Director of Operations. Another part of the ImagineH2O prize is that the winner in the early revenue track, New Sky Energy, will receive a BlueTech Research Premium subscription. “We are an ardent supporter of water entrepreneurship and innovation and are pleased to have been a media partner and participating sponsor in the Imagine H2O competition. Bilexys will be a great addition to the 2012 BlueTech Forum Technology Showcase exhibitor slate,” says Paul O’Callaghan, CEO of O2 Environmental. Known as THE industry event for water tech professionals, the informative and dynamic BlueTech Forum which will be held May 30 in San Francisco, provides game changing ideas for its high-level attendees, and brings together water industry leaders, investors and start-ups to address and discuss the development, financing and commercialization of innovative water technologies. The one-day, BlueTech Forum features speakers with thought provoking perspectives on industry issues, opportunities, challenges, and technologies. This year’s impressive group of speakers will address emerging markets, new technology solutions, and water in the green building arena. The BlueTech Forum Technology Showcase, a differentiating feature of water tech events, showcases companies like Bilexys with disruptive ideas and strong go-to-market strategies. Company CEOs will outline their technology, target market, business strategy and company stage. Register today and take part in the event for water tech professionals. 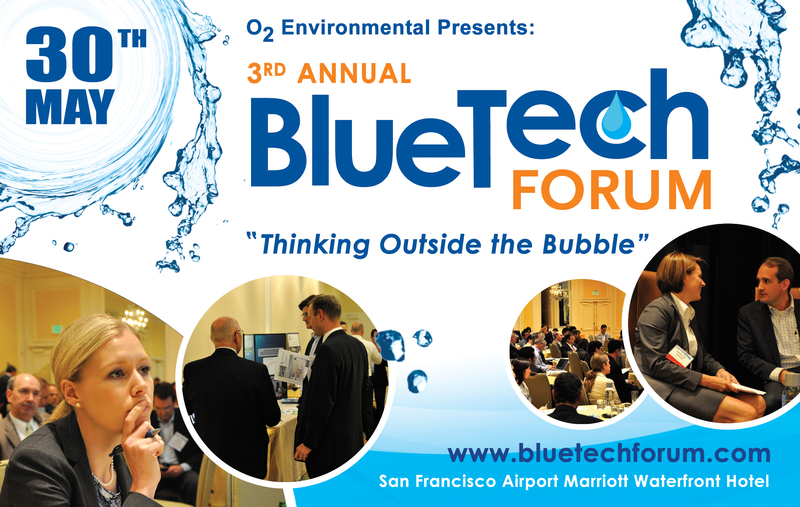 Attend the BlueTech Forum, May 30, 2012 in San Francisco for fresh perspectives on familiar issues and challenges, investment opportunities, networking and new water strategies and technologies. Imagine H2O inspires and empowers people to solve water challenges and turn them into opportunities. The organization offers annual prize competitions for water innovation, including the 2009 Water Efficiency Prize and 2010 Water-Energy Nexus Prize. In addition to cash prizes for the best ideas, Imagine H2O fosters an Accelerator program to help competing entrepreneurs turn their plans into game-changing real-world solutions. To learn more about Imagine H2O's global ecosystem for water innovation and connect with water innovators from around the world, please visit http://www.imagineh2o.org. Media Note: Accredited members of the media may attend the BlueTech Forum at no charge. However, they are required to register with Donna Vincent Roa, Managing Partner & Chief Strategist at Vincent Roa Group. Limited seats available. Prior to and during the Forum, Paul O’Callaghan, CEO of O2 Environmental, Water Technology Experts, and other speakers will be available for interviews at the event.